Japan's Daisuke Takahashi won his second title at the 2011 Four Continents Figure Skating Championships. World Champion Daisuke Takahashi won his second Four Continents title Saturday in Taipei and positioned himself as one of the top contenders for the World Championships next month in Tokyo. Youngster Yuzuru Hanyu, also from Japan, snatched the silver medal, while USA’s Jeremy Abbott bagged the bronze. The season hasn’t gone too smoothly for Takahashi, who was left off the podium at the Grand Prix Final and finished third at the Japanese Nationals in December, but the reigning World Champion is rebuilding confidence and strength as Worlds in his home country are drawing closer. Winning the Four Continents title was another stepping stone for the 24-year-old Japanese, although his performance wasn’t perfect. Takahashi crashed on his opening quad toe that was downgraded, but he recovered to land a triple Axel-double toe, another triple Axel, and four more clean triple jumps. However, the back end of his triple Lutz-triple toe combo was underrotated. He earned a level four for one spin, but the other two were a level two. The 160.51 points for this performance were a season’s best, and overall, the skater accumulated 244.00 points. Hanyu turned in a solid free to Zigeunerweisen by Pablo de Sarasate that was highlighted by a beautiful quadruple toeloop, a triple Axel-triple toeloop, another triple Axel, and four more triples. However, the Lutz didn’t work for him today as he singled the first one and put down his hand on the second. The current World Junior Champion scored a season’s best of 151.58 points, and stepped on to the podium in what was his senior-level championships debut with 228.01 points total. He was the only man tonight to put out a clean quad. For Abbott, it was about redeeming himself and ending the season on a high note. He landed six triples in his program to La Vita E Bella, but some were a little shaky and he fell on an underrotated quad toe. The two-time U.S. Champion achieved a season’s best with 148.98 points and dropped one spot to third at 225.71 points. It was his first medal at ISU Championships since 2007 when he also took the bronze at Four Continents. Abbott explained that he will keep on training as he is the first alternate for Worlds. Takahiko Kozuka came back stronger from his sub-par short program, but wasn’t perfect. The Japanese Champion hit two triple Axels, but the triple loop was wobbly. He also doubled the Salchow and missed the quad toe. Kozuka pulled up from sixth to fourth at 223.52 points. He was ranked second in the free skating. USA’s Adam Rippon was in a similar situation like last year. He had missed the Olympic and (originally) the World team (later he came in as an alternate) and was sent to Four Continents. Last year, he didn’t skate too well in the short but won with an excellent free skating. This year the American had to settle for fifth place. The triple Axel gave him trouble again. Rippon doubled the first one, and stumbled on the second one which was downgraded. Three other jumps were underrotated. The defending champion scored 210.01 points. Overall, Rippon didn’t feel at his best. Jinlin Guan was the top ranked Chinese man in sixth place with all three competitors giving solid performances. Guan fell on the quad toe but his seven triples were clean. However, he does not include a triple Axel into his programs. USA’s Armin Mahbanoozadeh dropped from fifth to seventh. Several jumps were shaky or not clean. Jialiang Wu of China reeled off the maximum of eight triple jumps with the only glitch being a flip with an edge call. He came in eighth. Teammate Nan Song impressed with two big triple Axels, but fell on a loop to finish ninth. Shawn Sawyer rounded up the top ten. The Canadian’s free program to Alice in Wonderland is truly a little spectacle on ice. Each gesture and each move feels right and looks great, and he really brings his character of The Mad Hatter across. Sawyer showed off his flexibility in his spins and a spiral move. Unfortunately, some jumps were tight on the landing and the Technical Panel deemed not less than four of them underrotated. That cost a lot of points, but Sawyer took it in stride. 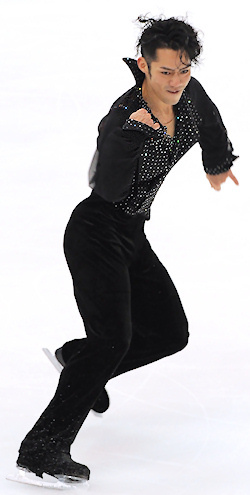 Teammate Kevin Reynolds wasn’t able to improve from yesterday’s short program. He fell on both the quad toe and Salchow with the latter one being underrotated. The Canadian also underrotated a triple Axel and singled a loop and the second Axel. He pulled himself together in the second half of the program and hit five triples. Misha Ge of Uzbekistan was a little discovery in Taipei. The 19-year-old competes in his first season internationally and drew attention with his musicality and expressiveness. He has solid triples up to the Lutz, and finished a respectable 12th.